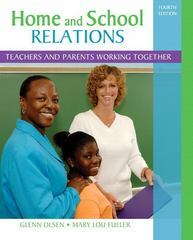 Home and School Relations 4 Edition For in-service and practicing teachers and for parents as well, Home-School Relations examines the nature of the contemporary family and its relationship to the school, and provides practical advice for developing strong home-school relationships and solid examples of building good home-school partnerships and fostering parent involvement. This textbook discusses the need for educators to have positive working relationships with the students they teach and describes the techniques they must use to understand the families from which their students come. In addition to covering the traditional topics of ethnic families, change in families, and parent-teacher communication, this practical and popular text delves further into the issues facing families today and their effect on families including: income level, advocacy, the father’s role, family and domestic violence, bullying and school violence, parents’ perspectives on schools, opening new paths of understanding for educators. The text features a multitude of practical information such as descriptions of the successful parent-involvement programs, contains an excellent chapter on communication skills and activities, helps educators understand the legal and policy aspects of home-school relations and educational choices, and incorporates working with students with special needs in the classroom. Diversity (cultural, racial, religious, and sexual orientation) is integrated and discussed throughout the textbook to promote understanding of all students and their families, including those with special needs. Unlike other books in this field, Home-School Relations confronts the alarming statistics on poverty and how it affects children, and ultimately, their performance in schools.